350DVD Children’s Guide Video Companion DVD $12.95	 Qty. 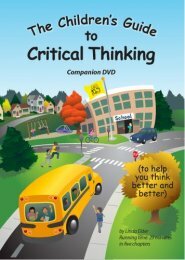 The Miniature Guide to Critical Thinking for Children is a small booklet that introduces young (K-6) children to the basic concepts of critical thinking. Using three generalized characterizations of kinds of thinkers, the booklet includes such topics as intellectual standards of thinking, inferences, and assumptions. The information is provided in clear, simple language with black-and-white illustrations. The Companion DVD contains a brief introduction and three segments, each approximately five minutes long: "Standards of Thinking" explains such guidelines as "Be clear" and "Be logical." "The Parts of Thinking" includes components such as questions and assumptions. "Intellectual Virtues" discusses such qualities as integrity and perseverance. In the spirit of "Fairminded Fran," I must say that I think the information provided in these materials is worthwhile, well organized, and visually appealing. Training our minds toward intellectual rigor is a worthwhile endeavor.